Que dœuvres! Nous y avons passé 4 heures mais il faudrait y revenir de nombreuses fois pour tout apprécier. Nous n'avons même pas pu tout écouter des explications de l'audio guide. Le musée est sensationnel. You get exactly what you sign up for which I LOVE. The tickets were easy to obtain and we had no issue when entering either museum. Both museums require more time than we gave them though so I recommend giving yourself a full day rather than a half day. This is a must do in Vienna. The Kunst Museum is filled with amazing sculptures, ornaments etc. and most of them are in gold or ivory. There is also an Egyptian area but we did not go to that. Imperial Treasury is a little hard to find but look for the red and gold archway on the right hand side before you get to the Spanish Riding School if you are coming from the Kunst museum. The treasures are mainly royal regalia, crowns etc. There are also a lot of costumes and ceremonial robes to look at. Located in the historic centre this is a superb gallery that includes extraordinary collections of Egyptian, Greek, Roman antiquities, stunning art collection as well as temporary exhibitions. Impressive scale and somewhat overwhelming at times in terms of grandeur and splendour. It seemed to have one of the most popular coffee rooms in Vienna. Although I could not get a seat the patisserie looked out of this world. This Kunsthistorisches is amazing - excellent art collection and plenty of seats in each room so you can relax and enjoy the paintings. Put aside a few hours to enjoy this. 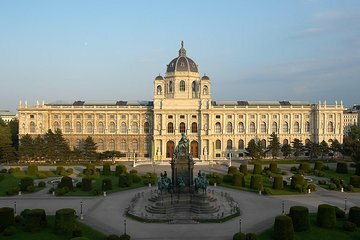 Well worthwhile tour for those interested in imperial Vienna and the Habsburg Dynasty. The highlight of the Treasury was the display of the Habsburg imperial crown and the coronation regalia. I enjoyed this tour because I was my own 'guide', and I could see the things that I was interested in, and could spend as much time as I liked at each display.